Improve your facility air quality while still keeping the dock door open in spring or summer months. 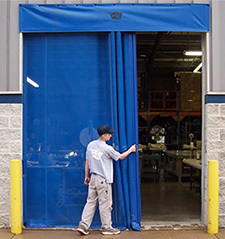 Durable mesh doors help reduce cooling costs in warehouses, manufacturing plant, or distribution center while blocking out pest and debris. Great for production facilities that can’t afford to have painted items or sensitive equipment marred by airborne debris or insects. Manual sliding doors are ideal for dock doors, but are opened and closed by hand. For heavily-trafficked forklift portals, contact us for information on mechanical or spring-loaded doors. Doors also provide a measure of security, regulating foot traffic from outside the facility. When ordering choose from 7 standard colors: Due to variations in computer monitor display settings, the color chart below may not reflect exact color representations. If exact color selection is a priority, contact us for a paint swatch sample before placing your order. Please call customer service for assistance or for more information on the spring assist and roll-up doors.